My Volvo has been in the shop at Concours Cars for the past month having its annual makeover, coinciding with a bunch of business travel I had for DevExpress. This time it was the gauges (tachometer, oil and water temperature, speedometer, fuel gauge, oil pressure, and clock) that needed to be refurbished or renovated and replaced. As there was also a split in the dashboard cover, that was replaced as well. (Click to enlarge.) If you look carefully you can see the clear plastic is crazed on the speedo. 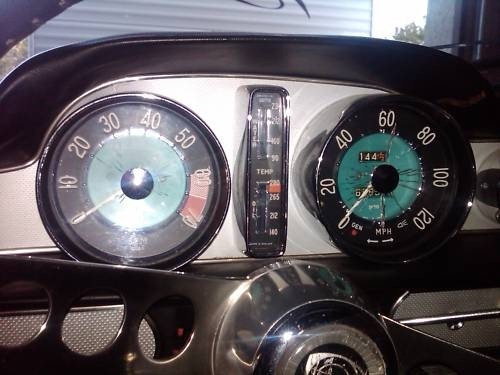 Although it’s difficult to see in this particular photo because of the flash, the same was true of the tach. For those that know the early P1800 series, this photo also shows that the central vertical temperature gauge wasn’t working either. 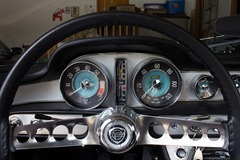 As part of the original deal, the seller provided spare gauges pulled from another car, so Concours Cars sent them off to Nisonger Instruments to be renovated or refurbished. They’re Smiths instruments experts, and, despite being a Swedish car, the Volvo has Smiths instruments out the wazoo. For the tach, they converted it to a modern electronic unit (still using the same needle, though), and the clock’s innards were taken out and replaced by a quartz movement (for Volvo owners, it is a rueful truism that the clocks on P1800s never worked beyond about a couple of years – they would seize up or burn out). The rest of the gauges were opened up and lubricated and the chrome and faces polished. We also decided that, as the speedo was going to be pulled, we should replace the speedo cable (the one that was in there was exhibiting the classic symptoms of being ready to break – the speedo needle would bounce once the engine was warmed up). (Click to enlarge.) Marvelous. Just look at central temperature housing now. It’s just beautiful: the yellow water temp gauge, the blue oil temp gauge, and the red warning label all encased in this chrome box. Brilliant! The dash cover that was replaced was the top one (the split was just above the tach): it now looks and feels great. The speedo needle now stays nailed to the current speed; all bouncing has gone. Apart from that, Jed at Concours Cars also did the usual annual service and check-up (a warning has been issued against the clutch cylinder and hoses ready for next time; they’re preordering the parts) and topped up the Freon in the after-market air-conditioning unit. The a/c now blows out lovely frigid air; just in time for the next heat wave. All in all, a great bit of work. Of course, it’s lovely driving around in it again after a month of separation, but – even more – having a complete set of working gauges makes the whole experience much better. I can’t believe how much I missed the colors of the temp gauges.